According to researches, 1018 plant types were identified, of which 939 belong to the autochthonous flora. 230 of these plans fall under medical herbs. About 80 types of plants, mainly exotic plants, were brought from other parts of the world by masters and sailors from Losinj. Because of the typical climate plants from south Dalmatia and Sicily can be grown. Here grow agaves, Mexican cactus (opuntia), palm trees, magnolias, mirth, pistachios, mimosa, fig tree from India (karmus-nassarah), lemon, orange and mandarin trees (brought from Vietnam to Palermo, and then to Mali Losinj). On the side of Cikat the woods slowly changed into a park. Today the thick pinewoods of Losinj are the symbol of the island and a valuable asset in its tourist development. The Čikat has been nominated a park of nature. On the island there is small game: rabbits, wild rabbits, stone marten, while bigger animals: fallow deer and mouflon inhabit the southern part of the island of Cres.There is lots of feathered game – partridge, snipe and settled pheasant. From the birds of prey here live the hawk, the sparrow-hawk, the falcon and the white head vulture, which is because of the small number of known examples protected by law. Among the farm animals the most spread are sheep usually found on the rocky side of the northern part of the island of Losinj. In our seas live 95 types of fish, 71 types of crabs, mussels, snails, and different types of marine flora. 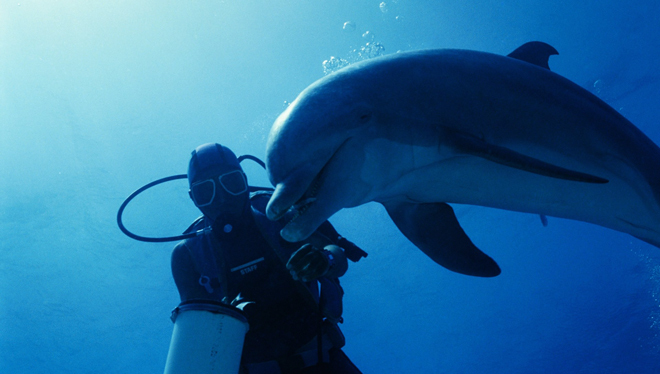 Dolphins are regular visitors, playful and ready to establish contact with humans, not unlike in adjacent local waters where they are completely extinct. They are excellent biological witnesses of the state of nature in which they live.